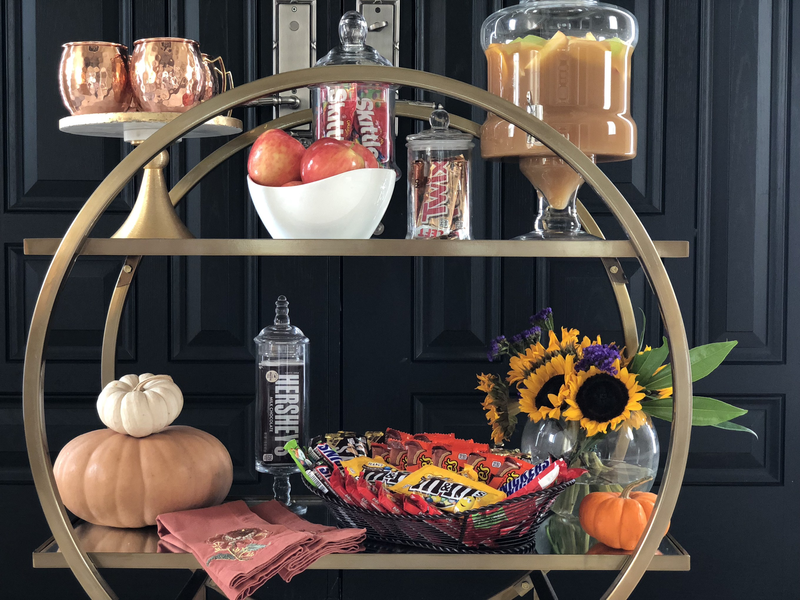 Make Halloween evening fun and easy with a bar cart set up to receive your friends and their little goblins. Halloween night has such a rich history, dating back thousands of years. How about starting a new tradition in your family by greeting your friends with tasty treats and a sip of Sangria? Halloween’s origins date back to the ancient Celtic festival of Samhain. The Celts, who lived 2,000 years ago in the area that is now Ireland, the United Kingdom and northern France, celebrated their new year on November 1. The American Halloween tradition of “trick-or-treating” dates back to the early All Souls’ Day parades in England. During the festivities, poor citizens would beg for food and families would give them pastries called “soul cakes” in return for their promise to pray for the family’s dead relatives. How Does Our Family Celebrate Halloween? Halloween day in our family usually begins with a neighborhood block party. More often than not, Halloween falls on a school day, making the day more challenging. The kids in our neighborhood come home from school, get dressed up in their favorite costume and head out to join friends and parents for pre – trick or treating festivities. The kids play games, run around, the parents socialize and hand out candy. One year my son dressed up as a zombie, his makeup was so realistic, it was freaky. After the block party, we will usually go trick or treating as a group with friends, many riding through the neighborhood on golf carts. But if we did, I would have a cute bar cart set up to greet my guests! I love the idea of having a cart next to the front door with candy to hand out to those adorable little kids. It’s also fun to ask neighbors inside for a hot toddy or a glass of sangria. Typically Halloween is chilly in our area and a warm drink would be a welcome treat. I put together my bar cart HERE to give you ideas of how you can style one yourself. Everything on my cart were items I already had in the house, with the exception of apple cider for the sangria. You will be amazed at what you can find when you rummage through your kitchen and pantry. You’re probably wondering why we have so much candy on hand in our pantry? As I mentioned, we hand out candy to the kids at our neighborhood party. The kids form a line and we have a Halloween parade. We have stocked up for the event already and hopefully the candy will last until Halloween. (So far, we are down 2 Hershey bars because of me). Yea…I know, the kids get way too much candy on Halloween already and this is even before we go out trick or treating! We end up giving most of the candy away…but not until I have picked out all the Snicker Bars, my absolute favorite candy. Sunflowers last forever! I put together this arrangement over a week ago HERE and they are still going strong. Small little baby boo pumpkins scattered around the house are used on the cart next to a wire basket of candy. A pitcher HERE of Sangria is the perfect Fall drink. Here is a quick recipe for this Fall cocktail. Fill large pitcher with sliced apples, lemons, and oranges. Add apple cider, ginger beer, and white wine. Stir mixture then pour into serving glasses. Using my favorite Moscow Mule copper mugs HERE, dresses up the cart and adds beautiful color. Using glass containers of different heights for candy adds a pretty accent. You can find them HERE, HERE and HERE. And my outdoor heirloom pumpkin still looks great, so it got a place on the cart too. I love my cart, it is on wheels so it travels around the house with me. I can place it anywhere in the foyer area. It is so versatile and easy to style. Do you have a bar cart? How do you style it? For more styling ideas and decor inspiration, subscribe to Happy Haute Home and follow along on Pinterest HERE, and Twitter HERE and feel free to pin and tweet your favorite pics from Happy Haute Home. I’m definitely trying the apple cider sangria. Any particular white wine you use and what size bottle of ginger beer? These usually come in regular beer bottle size right? Hi Toya, Any white table wine would mix well in the Sangria, and yes use a regular size beer bottle of ginger beer! LMK how it turns out! I sure will. Can’t wait! !